Southern California is one of the top destinations in the world for whale watching, including whale watching opportunities during all four seasons of the year. During the winter and spring, you can get an up-close view of Gray Whales as they migrate from Alaska to Southern California and Mexico. In the summer and fall you can see Blue Whales and Finback Whales. During one cruise, you could easily spot five whales. Newport Landing Whale Watching has served the Los Angeles area for over 30 years, providing whale watching and dolphin cruises daily. Year around cruises offer opportunities to view many varieties of whales, including the giant blue whale (over 90 feet long) during the summer and fall months, while Finback and Gray Whales are likely to be seen during winter and spring. Throughout the year you might see Minke Whales, Orcas (Killer whales), or Humpback Whales. There are many types of dolphin (including giant Risso's dolphin - over 14 feet long! ), seals, and a large variety of marine life. Each cruise is a unique experience; you may never know what you might encounter. The waters surrounding Newport Harbor are deep and full of nutrients, attracting whales, dolphins and all types of marine creatures. As an added bonus, the Laguna Beach coastline is just south of Newport Harbor and offers some of the most beautiful coastline in Southern California. Newport Landing's primary whale watching ship is 65 feet in length with a large upstairs sundeck, wrap-around seating outside, and indoor seating with large windows. There is a snack bar with food and beverages. Our whale watching ship was designed specifically for viewing marine life. 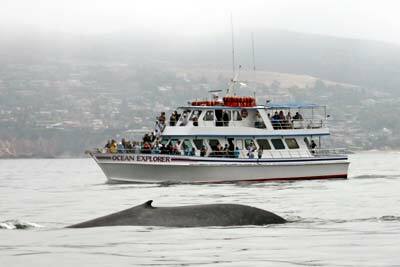 There are many other amenities to make for a very comfortable and exciting whale watching trip. Captains and crews are experienced in marine biology, and offer knowledgeable details on marine creatures, the environment, and ecological systems. Newport Landing is located in Newport Bay, Newport Beach and only minutes from downtown Los Angeles. With a 96% success rate viewing whales and/or dolphin almost every trip has viewing opportunities for these mammals. 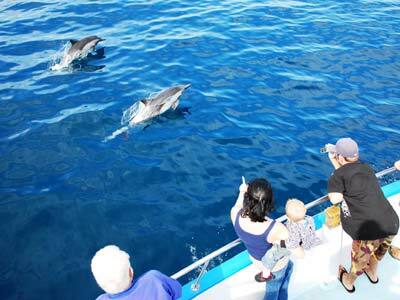 Whether for an individual or for a larger group looking to join one of the general admission whale watching cruises, Newport Landing Whale Watching takes great pride in sharing the magical experience of our whale and dolphin cruises. Fashion Island Shopping Center [website] - in Newport Beach. Features more than 200 stores, 40 restaurants and two cinema complexes. Bayside Center Shopping Center [website] - Grocery store, pharmacy, restaurants and a few other stores, near Newport Bay. South Coast Plaza (8 miles) [website] - in Costa Mesa. Flagship stores are Macy's and Bloomingdales, plus dozens of boutique stores. Hiking at Crystal Cove State Park [website], which has 17 miles of trails, over 3 miles of beach and 2,400 acres of undeveloped woodland. Traditional beach activities include swimming, surfing and exploring tide pools. Other park activities include hiking, horseback riding, mountain biking, as well as scuba and skin diving. Public Transportation - Orange County Transportation Authority (OCTA) [website] Route 71. From Balboa island, take the Balboa Island Ferry [website], which docks only steps away from Newport Landing.